Tip of the Italian boot, Calabria takes Italy to the extreme. This narrow strip of land sandwiched between the Tyrrhenian and the Ionian Sea has been the centre of the Ancient Greek Empire, a battleground for peasant revolts and a stomping ground for philosophers. Now it provides a fantastic tour through the history of Europe bathed in the warmth of the southern Italian sun. Calabria offers its tourists and visitors a great artistic and cultural heritage, enriched by exquisite culinary specialties, craft traditions and folklore, and infinitely warm inhabitants. Every year, nationals and internationals flock to its more than 700km of coastline, lapped by the tranquil waters of the Ionian and Tyrrhenian Seas, finding the ideal place to spend a few weeks away from the stress of the city. The two opposing Calabrian coastlines both contain their fair share of beauty: the Tyrrhenian coast showcases pristine stretches of sand such as Scalea and Tropea, unspoilt by building development. The Ionian coast is home to some of the most beautiful beaches in Italy, whilst the section of coast that lies in Reggio Calabria is covered in jasmine flowers, in the past harvested and exported to France for the preparation of perfumes. In Calabria, long beaches of fine sand alternate with more discreet coves, reefs and high cliffs, a feature which very few regions in Italy can claim. Natural beauty combined with historic towns and fantastic weather has made this region one of the most desirable for visitors. Its people also have an innate gift for hospitality, managing to win not only the hearts of tourists, but also their palates, thanks to culinary traditions which have been passed down from generation to generation. Away from the beaches, Calabria is also home to a rugged section of the Apennines. The main mountain range in the region is the Aspromonte, dominated by the 1,955-metre peak of Montalto. Its landscape is a succession of hills and valleys, marked by rivers running along their bottoms, transforming into roaring tides in spring and summer with abundant rain. The crystal clear waters of Calabria aren't just for swimmers and beach bods. In fact, they are also a great place to try out alternative water sports, such as windsurfing, kite surfing or scuba diving. The depths of the Ionian Sea are home to countless varieties of fish (and sharks, beware! ), as well as wrecks from the Second World War, which will delight all fans of military history. For those not wanting to spend all their time sprawled out on beautiful Calabrian beaches, the area also offer fantastic hikes and walks surrounded by lush green forests. The parks, plateaus and protected areas make for a wonderfully varied landscape and the proximity to the coast of some parks, such as the Sila or the Pollino, allow for a great holiday alternating between heaven and earth. The ancient Greek settlers certainly left their mark all over Calabria, leaving behind almost all of the small towns you'll find today. If you are fond of ancient history and archeology, the National Archaeological Museum of Magna Grecia in Reggio Calabria, also known as Palazzo Piacentini, is the place for you. Downstairs there is a section dedicated to marine archeology and the famous Riace Bronzes, which have become over time a real symbol of the city. Calabria is very fond of the chili pepper, and the hot, red pods are grown all over the region and used to spice up many of the local specialities. If you like fiery flavours, you should go to Spilinga, a tiny village in the province of Vibo Valentia. 'Nduja', a kind of cream made of very fine sausage meat and lots of chili, is made there. You can spread it on bread, serve it with spaghetti, and even put it on pizza, but be careful - it really is very hot! 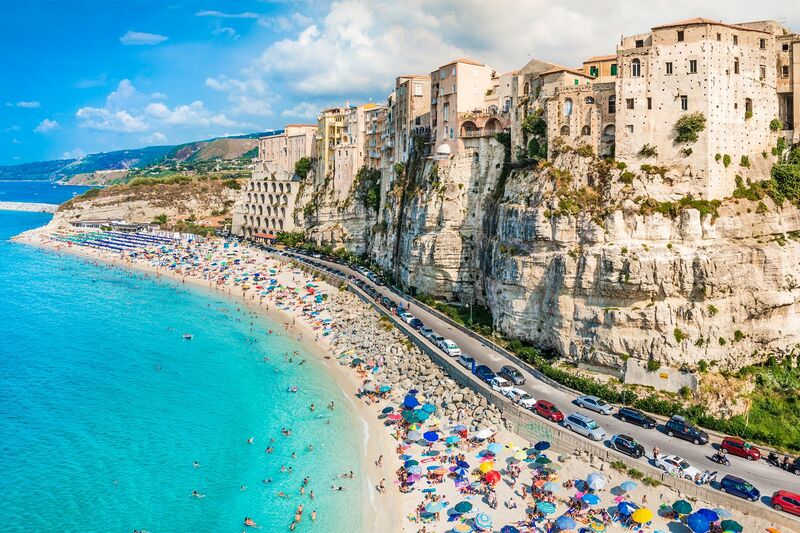 Tropea has a pleasant climate and very low annual temperatures due to the softening influence of the sea. This lends itself well to growing a rare variety of onion, the red onion of Tropea, which sells well in markets across the world thanks to its sweet flavour. It is usually found in the most simple of dishes, used to brighten up the overall taste.